2. For iOS iPhone besides SMS\SNS Sync, find phone all the other features are available. 3. Please install the sync App 'Runfun'(only for Android) to your phone before use. 4. If any issue with the watch please contact us first, we will help you solvel it ASAP. 5 When showing Bluetooth pairing request and time&date sync request, check to allow access to your contacts and call history, and click PAIR. 1. Phone Function: Supports micro SIM card, can be used to dial and answer call, send and view message, make hands-free Bluetooth call, sync contacts, call reminder, call log. 2. Bluetooth Device: Connect to smart phone, Bluetooth speaker, Bluetooth earphone, be used to receive notifications, play musics, make calls. 3. Find phone, SMS\SNS Sync (only for Android phone). 4. Others: Sound Recorder, Music Player, Alarm Clock, Calendar, Pedometer, Sleep Monitor, Sedentary Reminder, Browser, etc. Functions: Dial and answer calls, message, contacts, pedometer, camera, sleep monitor, sedentary reminder, music player, sound recorder, alarm, calendar, SMS\SNS Sync, find phone, etc. Compatibility: Compatible with Android and iOS phones, but for iPhone there is no sync App available, some functions like SMS\SNS Sync, find phone are not usable. Material: Adopt high Sensitive 1.54" HD 2.5D IPS touch screen, 0.3MP camera, soft rubber bands, durable and comfortable to wear. Strap is adjustable between 6.1-7.9 inch, fits most men, women, kids. Stand-alone Smartphone: When put in micro SIM card and TF card it will works as a smartphone, you can make calls, messages, surf Internet, use other pre-installed Apps with this watch. 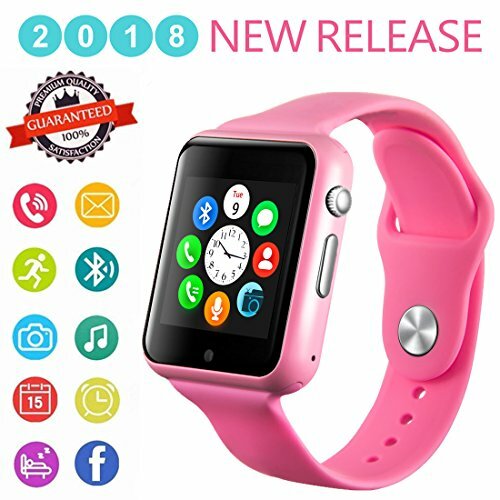 NOTE: This smart watch only support 2G (GSM 850/900/1800/1900 MHz) SIM card, maximum support 16GB TF card, do not support heart rate monitor, WiFi, video or GPS features. If you have any questions about this product by Hocent, contact us by completing and submitting the form below. If you are looking for a specif part number, please include it with your message.